Happy Monday crafters! 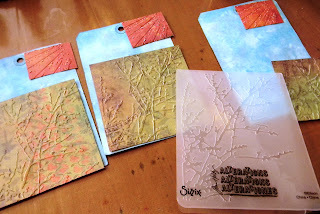 It's the beginning of a new challenge at Simon Says Stamp & Show, but before I tell you what it is, I would just like to say THANK YOU for making my first challenge week with SSS&S so special! All of the comments and emails have just touched my heart in the biggest way! You guys are the best, and make me feel so good. Thank you to all the new followers as well! WOW! Back to the challenge for this week....we want to see "Stars"! You’re welcome to take this inspiration literally or you can instead focus on a ‘star’ supply that you couldn’t imagine crafting without! 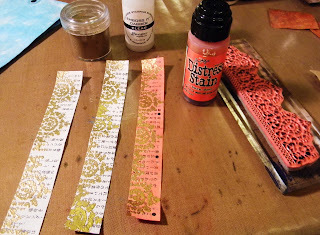 Some glitter that sparkles like a star could work, or how about a punch, a sticker, or some paper. You choose to interpret this challenge any way you'd like. Whether you’re inspired by the night sky, the sports all-star in your life, or the cute star stencil you just found, we can’t wait to see what shines in your project this week! 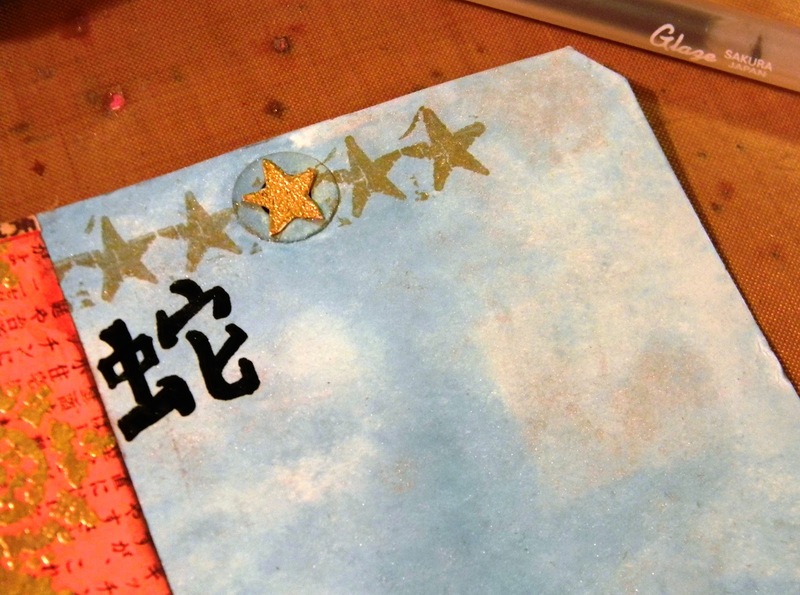 When I first read the challenge of having to use "Stars", I wanted to incorporate this with the New Year somehow. I am also involved in an Asian themed postcard swap, so that got me thinking in terms of astrology by means of the zodiac...the Chinese Zodiac. 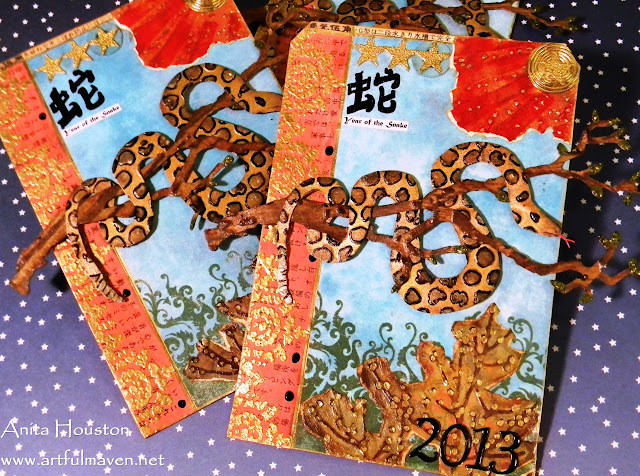 2013 is the Year of the Snake...yikes! I learned that from the paper place mats at my local Chinese restaurant, that are all detailed in gorgeous tones of red and gold. While I'm not into horoscopes or anything, I do find the place mats fascinating to read. They are almost always about what year you were born in, what animal you are represented by, and how other animals affect you. I'm a big pig, well technically a boar, and my husband is a snake. We are supposed to be mortal enemies. Even though we can put on a good fuss every now and again, I still like him after close to 21 years, so I don't place much creed in mortal enemies, but it's fun to discuss! 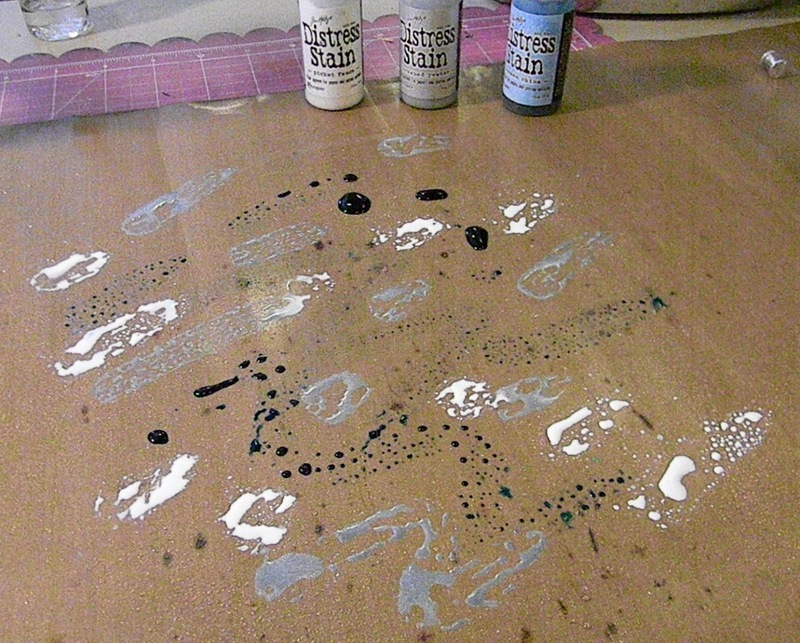 Using postcard shaped tags I got somewhere I can't remember, I made a Marbled Stained background ala Tim using Brushed Pewter, White Picket Fence, and Broken China Distress Stains, along with a water mister. Unbelievable as it might sound, I have a miniscule amount of Asian ephemera...to be exact, I have two 7 Gypsies Paper Pads with tiny amounts of Chinese writing on them, and a paper torn out of an Asian magazine that I received wrapped up in a package I ordered from Ebay, not paying attention that is was coming from China. It took weeks to come to me, but the paper was so cool I of course saved it. I have no idea what any of it says, but I think it is about different types of kitchen cabinets for sale based on the photos...cool! What was I thinking participating in a swap that was going to be very difficult to accomplish? Anyways, I used one of the 7 Gypsies papers in the Rays Texture Fade. It reminds me of the sun on the Japanese Flag. 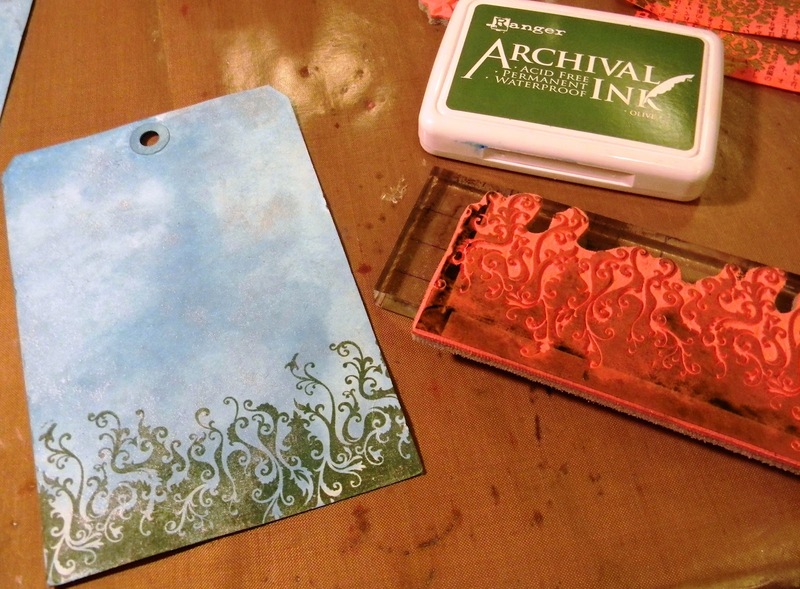 I inked over the raised areas using Vermillion Archival Ink and then coated it with Glue N Seal to stiffen it up. Hello McFly...now I can't see the writing! Ugh! On another 7 Gypsies paper from the Gypsy Market Stack, I used the new Winter Branches Texture Fade. I inked over it with Walnut Stain and coated it with Glue N Seal as well. I tore both of papers to give them that rugged look. Guess what? Can't see the writing on this one either! Here is the paper I received from my far away package. I searched through the stamp stash and pulled out what looked Asian ornate to me. 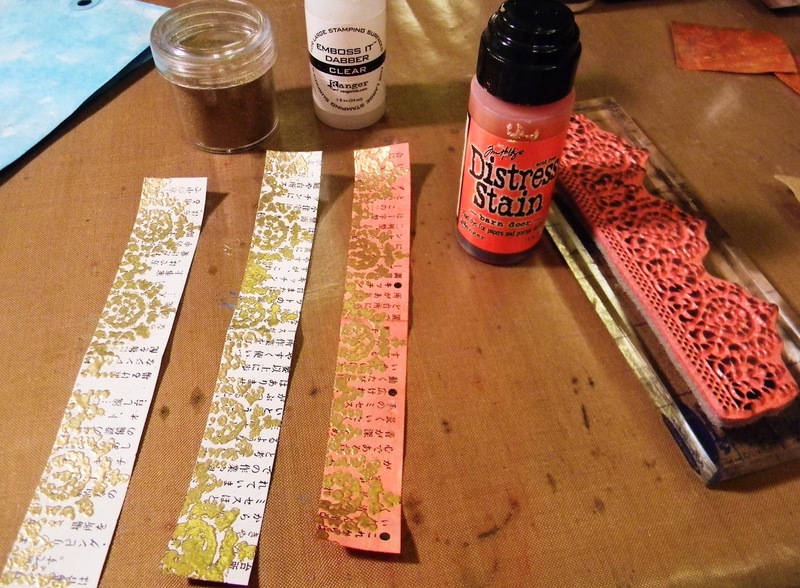 I cut the papers into strips, and heat embossed one of Tattoo Flower images on them using Queen's Gold. I colored the strips with Barn Door Distress Stain. I could smell Emboss It Dabber forever...yummy cinnamon! 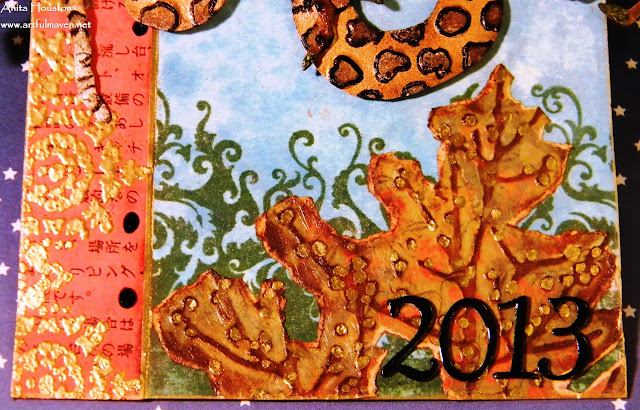 I stamped the Fiery Looking Vines from the Rockstar set in Olive Archival onto the bottom of the postcard. They look very Asian to me. I kept thinking a dragon would be cool here. I adhered my embossed strip and torn pieces to the card. I heat embossed the Row of Stars using Queen's Gold, and cut them apart thinking I'd only use one for the tag whole, but that was not enough for me, so I ultimately just did the whole row...much better. This reminds me of the Chinese Flag now. I looked online to see what the Chinese sign was for Year of the Snake, and did my best free hand of it with a Black Glaze Pen. 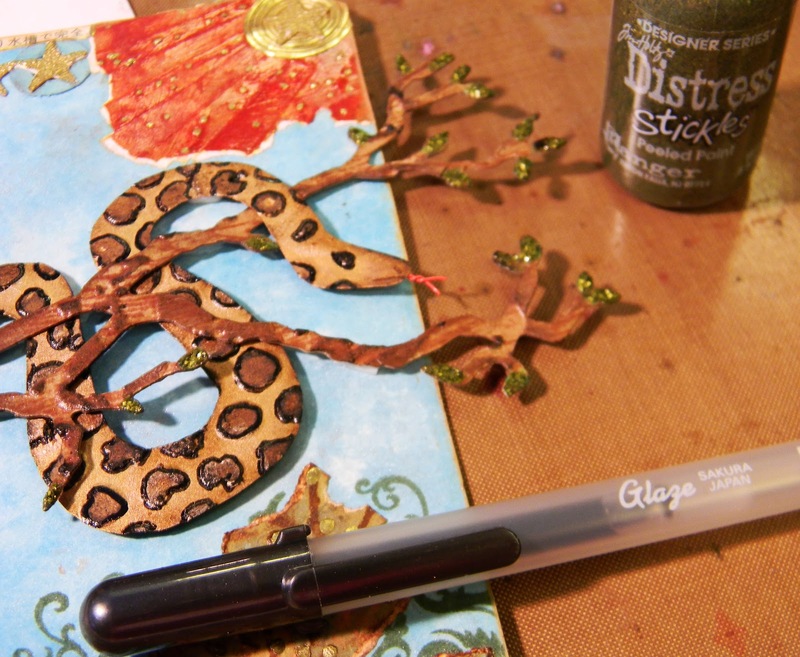 I die cut the branch using the Bird Branch die and Kraft Paper. I trimmed the bird off and will use him for something else later on. 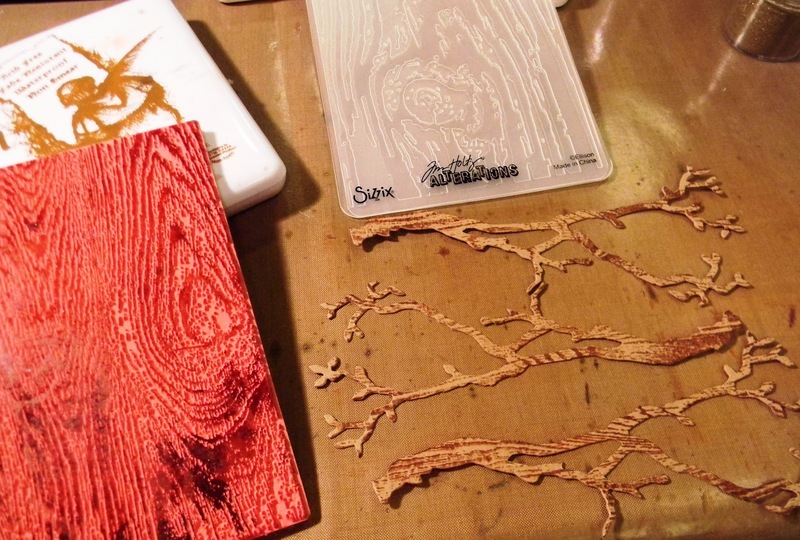 I stamped the branches with the Wood Grain image and Sepia Archival and then ran them through a Wood Grain Texture Fade. After rubbing a Walnut Stain Distress Pad onto the raised areas, I coated the branches with Glue N Seal to sturdy them up to hold a giant slithering yucky reptile. I read that this is supposed to be a black snake, but I'm from Texas, so it's a scary as all get out, oh my gosh I hate and never want to see you, rattlesnake. Yes, I don't like snakes! 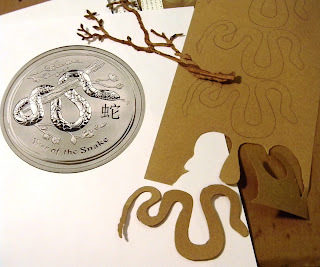 Using an image I found online of a creepy snake on a Chinese coin as my guide, I free hand cut a snake out of Kraft Paper and used it to make a pattern for the rest. I added that gross bumpy rattle...yuck! 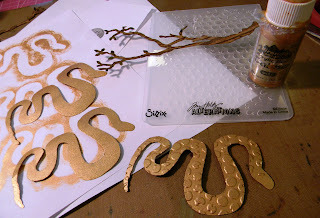 After painting the snakes with Gold Paint Dabber, I embossed them using Tim's Bubble Texture Fade. Talk about cool! I started liking my scary little guys and had a little paper doll fun with them. Here little hissy hissy!!! That Fade was perfect! I stained the rattle with Brushed Pewter Metallic Stain and some of the circles with Antique Bronze Metallic Distress Stain. 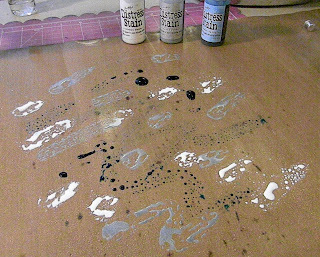 Walnut Stain Distress Ink was then directly applied from the pad to color in the rest of the circles. COOL! 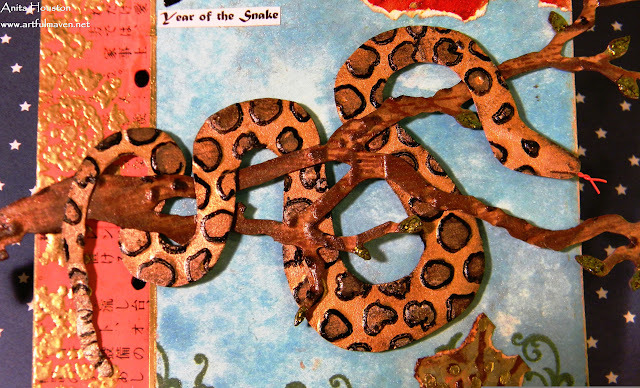 The snakes were finished off with a red wired tongue and some Black Glaze Pen detailing. Do these not look great? Am I allowed to say that? I love how they came out. Sick isn't? Yucky Snakes! I wrapped the snakes around the branches, and of course more play time ensued and now my son was playing a part. If we had Barbies available, they would have needed anti-venom and quick! The branch was given a little Peeled Paint Distress Stickles on the buds. Metal numbers for the year, a computer generated title, and some gold accents with a Krylon Marker finished this off. Show us the "Stars" in your life! 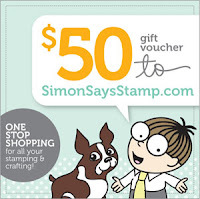 After you create your work of Art, enter it into our challenge, and you might be the lucky winner of a $50 voucher to Simon Says Stamp. You can also be named as one of the "Top Three Picks" for this challenge. Good luck, and don't forget to visit all of the other fabulous DT work this week...awesome! 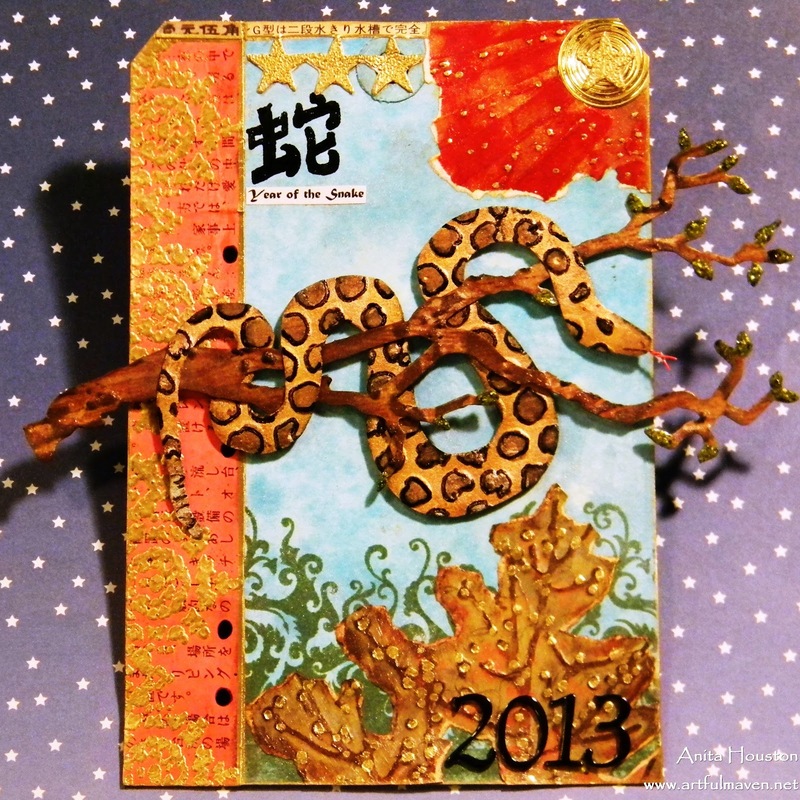 Fabulous background and I love your snake. Great interpretation of the Stars Challenge. Hoping to play along. I love you snake Anita,absolutely stunning.Great work. Another fabulously inventive piece - your sparkly snake is fantastic! Love the branches, and as a fellow non-Oriental stasher, I love how you've created the look from limited supplies and endless imaginative improvisation!! Oh, and I'm a Rooster - but I don't think I'm very Roosterish! That is great! 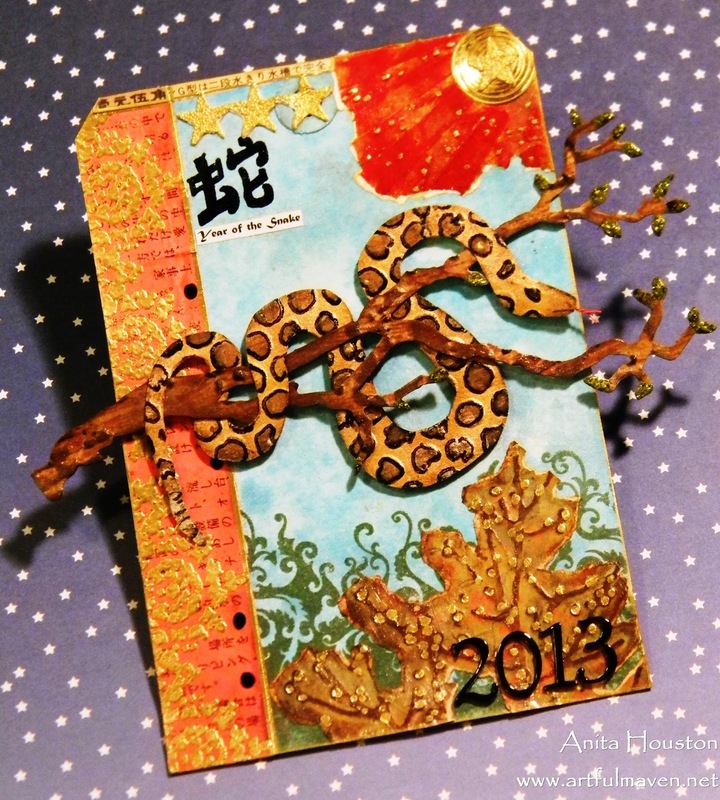 I love the background & the snake is terrific. Awesome! That is a great snake and all its great texture!! Love the background too. I am a "horse". Hmmmm. OK...so I really, really, really don't like snakes....except for this one. He actually turned out (dare I say it) kinda cute! 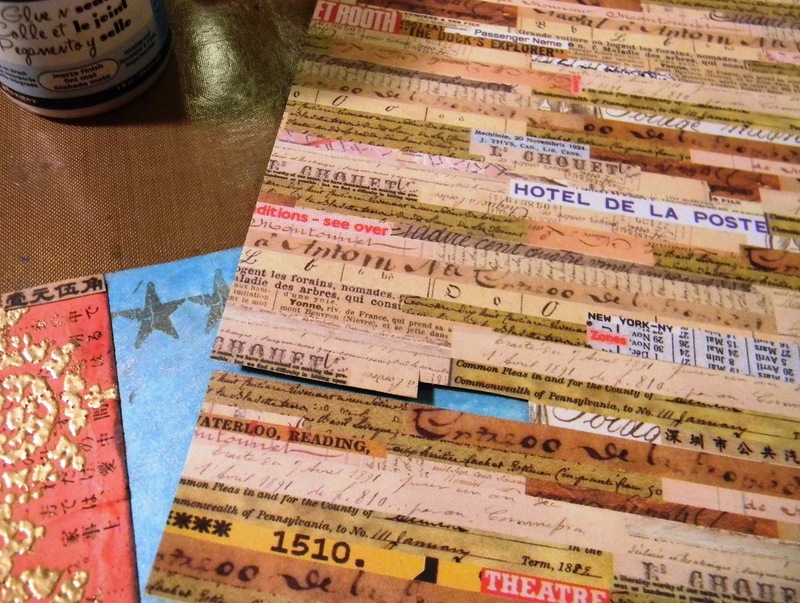 The card is amazing... so much wonderful texture and my favorite thing...the colors. Vibrant and warm....such a welcome sight in the middle of winter. You rocked it on this one, Anita! Super cool! This is fabulous Anita! 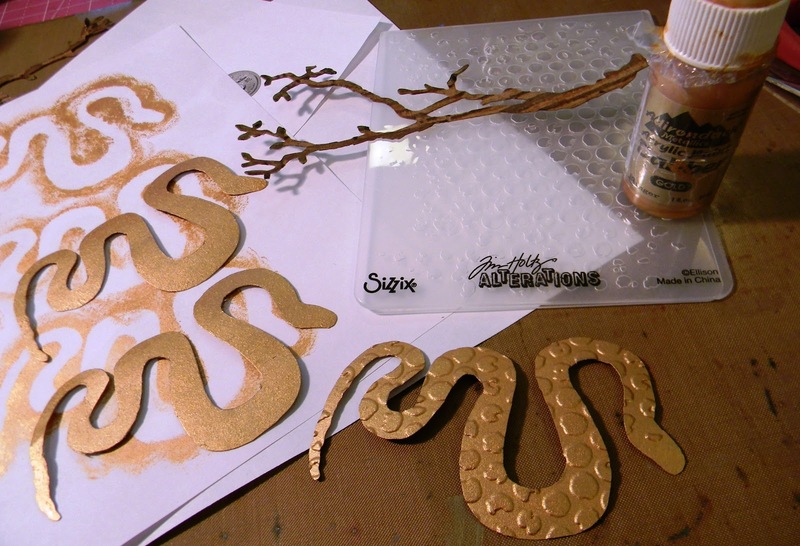 Such a clever way of making that snake! Love all the dry embossing and gold embossing. Just gorgeous! P.S. My favorite fortune cookie at our local Chinese restaurant read, "You like Chinese food." OMG...even Confucius say, "uhh...duh!" Wow!!! This is a great snake with beautiful colors. So good idea to put it on a branch. All elements of your beautiful work I love:) Gorderous leaves and the background is really stunning beautiful colors. What an effort you've put in this Asian looking tag, Anita! The snake is an amazing eye catcher...gorgeous! I really don't like snakes either! I have dreams about them sometimes! But you did a marvelous job on this ATC! Always so inventive! It reminds me of Kaa from Disney's Jungle Book! Oh my stars! This is a wonderful creation. I bet your swapmates were blown away receiving such a cool card! 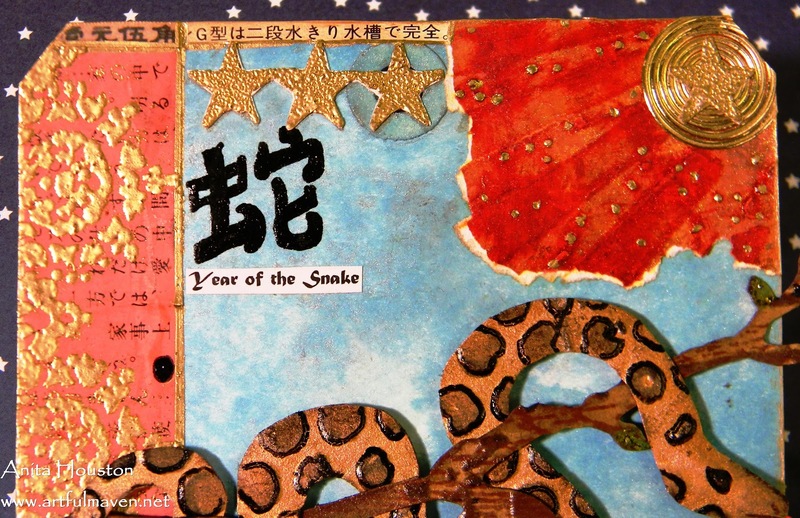 The texture on the snake is my favorite part. I love all the details - the rays torn for the sun, the amazing texture throughout the whole piece - it's fab!!! Stunning! I love (fake) snakes. The colors are gorgeous. How cool, that's really fabulous. How great, I love it and looks authentic Chinese, amazing! Cool take on the stars theme! 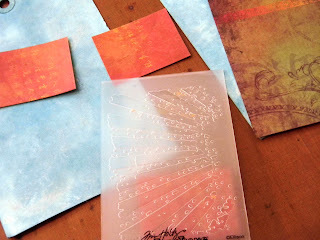 Love the effect of the gold embossing on the red background. Striking snake image! Wow!! This is gorgeous, Anita! I love the vibrancy of the colors and the detail is fabulous! 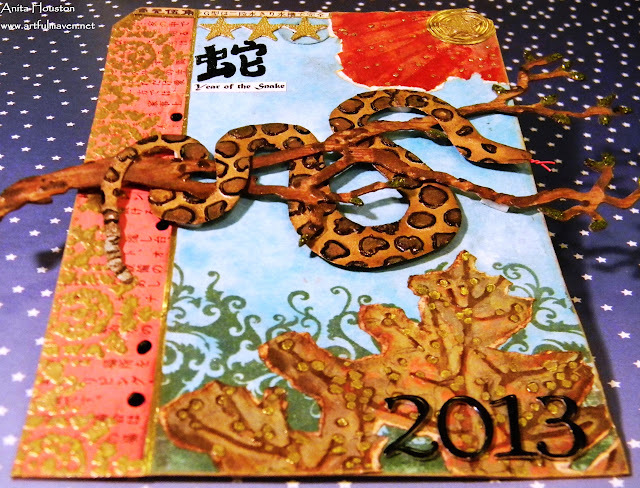 These are wonderful and your snake is amazing!!!!!!!!!!!!!! I absolutly love this! Asian art is one of my favorites! You made a beautiful and colorful piece of art. Fabulous, Anita! I saw this little number on SSSS earlier in the week and my first thought was - Is there anything Anita DOESN"T have in her craft stash? 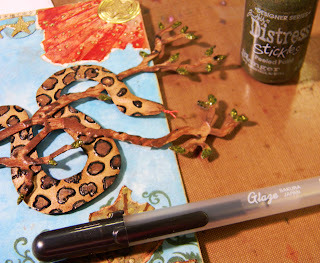 She even has perfectly proportioned snakes to drape over her branch die cut!. LOL. Of course now I see you made them yourself. I don't think I've seen anyone be so creative in the way they use their tools like you do. Amazing! And if I ever go to Texas I WANT to see a Rattler. It makes all our poisonous snakes look drab.